It would be very difficult to eliminate the worst of the allergy aggravators from your landscape and gardens. But there are things you can do, and eliminate, and add to the gardens to help reduce exposure to allergy triggers. Unfortunately some of the plants that can most aggravate allergies are grasses including bluegrass, and many of our staple trees including oak, maple and ash. But before you get out the chain saw and cover your property in pavers, figure out exactly what is triggering your symptoms. Spring, summer and fall produce different allergens. Perhaps it is tree pollen in spring, grass pollen in summer or weed pollen in fall aggravating your allergies. Paying attention to when you suffer most from allergies can help narrow down the offenders, which will help you to avoid the sneezing and itchy eyes. You will also be able to grow and care for your gardens and landscape differently if you know which plants are contributing to the problem. Keep in mind too, that plants that are pollinated by bees, birds and insects rather than wind born pollen will not be as likely to cause allergy symptoms. Don’t plant window boxes, you will get a blast of pollen every time you open the windows. 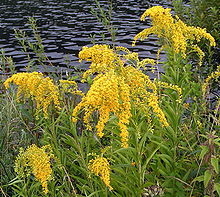 If you are allergic to ragweed in fall, don’t plant sunflowers, daisies or mums, they are all related. Johnson grass, Perennial rye grass, Timothy, Bermuda grass, bluegrass and fescue can all trigger allergies, but needless to say it is difficult to eliminate these. St. Augustine is one of the few grasses that are kind to allergy sufferers. The same goes for Maple trees, Oak, Ash, Birch, Olive, Hickory, Pine, Poplar, Willow, Cedar and Cottonwood trees. But at least with trees you can select something different. Shrubs are easy to make different selections, stay away from Cypress and Juniper shrubs. Take your allergy medication before you go outside. So evaluate your gardening habits and the plants you are growing. Start planning some changes to your gardens and landscape, you will soon be enjoying more time in your garden.